Front door from outside into Entrance Porch. Side aspect double-glazed window. Door into Entrance Hall. Side aspect double-glazed window. Under stairs storage cupboard, radiator. Side aspect double-glazed window. Built-in cupboards with sliding doors, vanity unit with inset hand wash basin and mixer tap with storage beneath, low level w.c., radiator. 23' 9" into bay x 11' 8" (7.24m x 3.56m) Front aspect double-glazed walk-in bay window. Featured fireplace, radiator, wall lighting, coved and smooth finished ceiling. Walk through to remainder with additional radiator, wall lighting, part-glazed French doors to Kitchen/Diner. 17' 9" x 15' 10" max (5.41m x 4.83m) Rear aspect double-glazed window and French doors to rear garden. Open planned and comprises a range of eye and base level units with roll edge work surfacing with one and a half bowl sink and drainer with mixer tap and tiled surrounds, integrated range cooker with extractor over, central island with storage beneath, cupboard housing fridge freezer, integrated dishwasher, built-in dresser, radiator, tiled flooring, coved and smooth finished ceiling with inset spot lighting, courtesy door to Garage/Utility Area. 19' 11" x 9' 11" narrowing to 7' 3" (6.07m x 3.02m narrowing to 2.21m) To the front there is an up-and-over door and double-glazed French doors into the rear garden and door to extension and Bedroom 4/Annex. 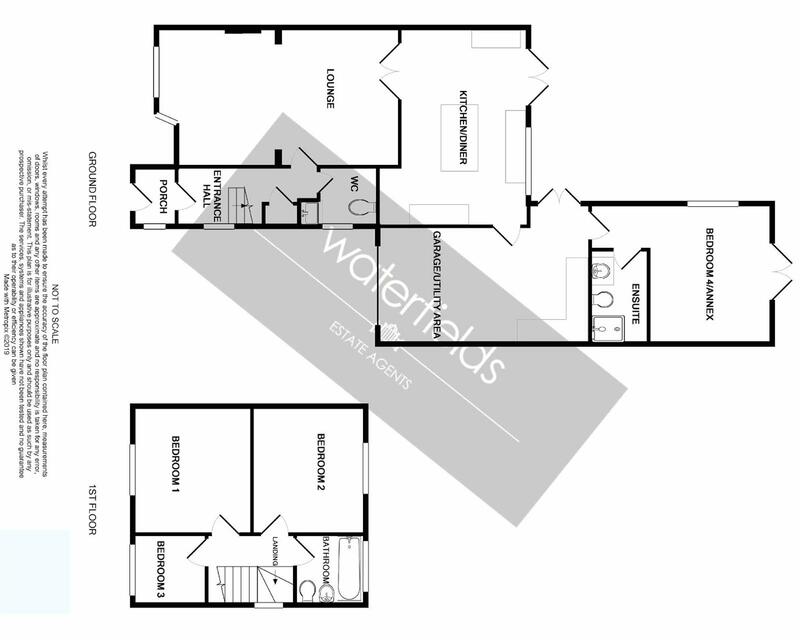 Utility area comprises roll edge work surfacing with cupboards beneath, space and plumbing for washing machine and tumble dryer, space for fridge freezer, wall mounted boiler, laminate flooring. 15' 1" x 10' 3" (4.60m x 3.12m) Dual aspect with rear aspect double-glazed French doors to rear garden and side aspect double-glazed window. Radiator, wooden flooring, smooth finished ceiling with inset spot lighting. Door into En-Suite. Comprises a fully tiled shower cubicle with power shower and extractor fan, vanity unit with inset wash basin and mixer tap, low level w.c., heated towel rail, laminate flooring, smooth finished ceiling with inset spot lighting. Side aspect double-glazed window. Access hatch to loft (fully boarded with light), doors to all rooms. 10' 8" x 10' 6" (3.25m x 3.20m) Front aspect double-glazed window. Radiator, smooth finished ceiling. 11' 6" x 9' 5" (3.51m x 2.87m) Rear aspect double-glazed window. Built-in cupboard, airing cupboard, radiator, smooth finished ceiling. 6' 11" x 6' 9" (2.11m x 2.06m) Front aspect double-glazed window. Radiator, smooth finished ceiling. Rear aspect double-glazed window. Refitted and comprising a panel enclosed bath with mixer tap and independent shower above, vanity unit with inset wash basin and storage beneath, low level w.c., with enclosed cistern, heated towel rail, extractor fan, laminate flooring. To the rear of the property the garden is extensive and over 100ft in length. It enjoys a south-westerly aspect and comprises a large timber decked patio (4m x 4m) stepping down to a lawned area, additional pathways, vegetable patches, greenhouse and timber shed. Behind the annex is an additional patio area which is bordered by a mature apple tree. The garden is enclosed by wood panel fencing. To the front there is gravel parking for several vehicles leading up to Garage/Storage area, flower beds, enclosed by wood panel fencing.